Very happy to say that after a year of curatorial work the Homefront Exhibition is finally open at the National Museum of Australia. 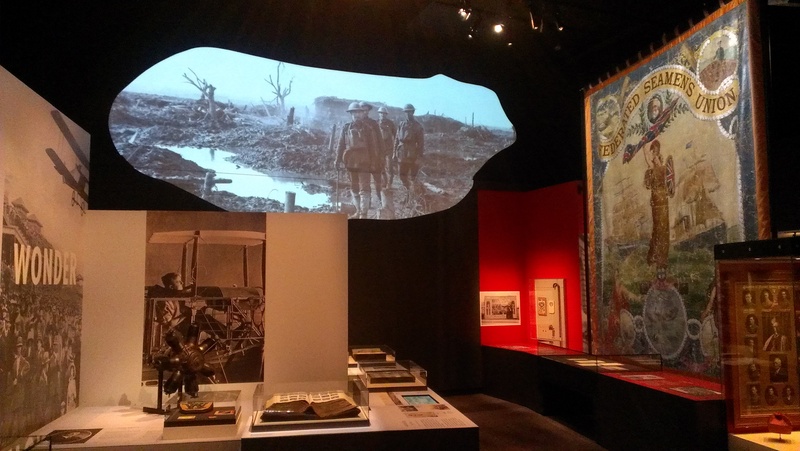 I think the look and feel of it is great and for that big thanks go to the space designer – Wendy Osmond and the graphic designer Virginia Buckingham – and of course all the NMA staff especially Janey Wood in exhibitions who worked tirelessly to keep the project on course. Special thanks also go to Jo Bach my co-curator who came on board and gave the exhibition a much needed fresh eye with eight months to go. The opening itself was a fairly grand affair with Senator Zed Seselja representing the Minister of the Arts, Michael Loebenstein, director of the National Film and Sound archives offering kind works, Dr. Mat Trinca, director NMA running the show, as he does so well, and the official opening by Professor Bruce Scates whose speech, in which he incorporated elements of 19th century frontier conflict with references to the actual modules in the exhibition was a wonder of soft diplomacy! There are a few elements I want to point out that I think work really well in the space. First are the projections, such as the one above, that you see in the opening shot of this post. 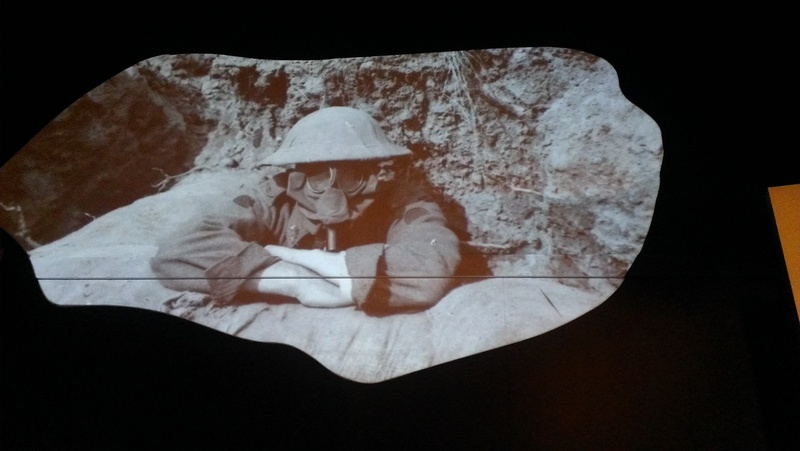 They appear high up on two of the walls and work fantastically well to give a sense of space and depth in the gallery while at the same time, because they are a constant roll of battle scenes, provide a reminder of the war that formed the background of all home front activities in Australia over the 1914-1918 period. 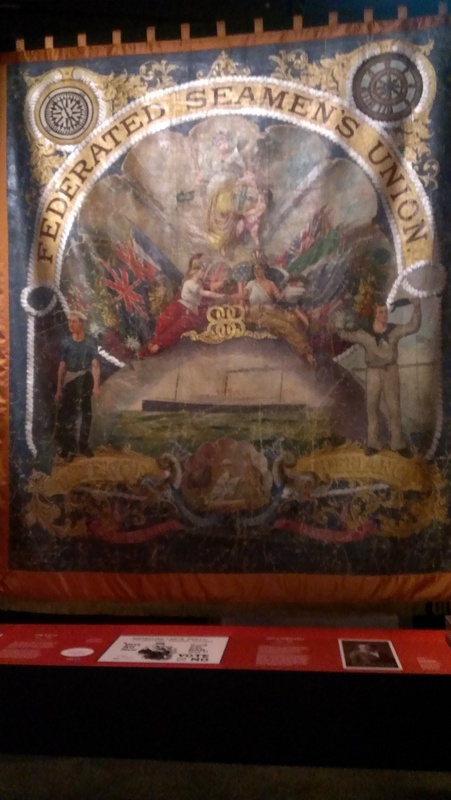 An element that was troublesome to get into the space was this 100-year old trade union banner, the frame had to be custom made and the raising of it in the gallery took at team almost the entire day. But it looks fantastic and again gives incredible depth to the space. I hope that Tom Walsh, the union and anti-conscription activist whose story the banner represents, would be happy with our treatment of it. The stories in the exhibition have been arranged along emotional themes, the reasoning for that is that emotions are what connect people to the stories and as a national institution whose motto is Where Our Stories Come Alive, I feel we have an unwritten responsibility to tap the emotions of Australian history. 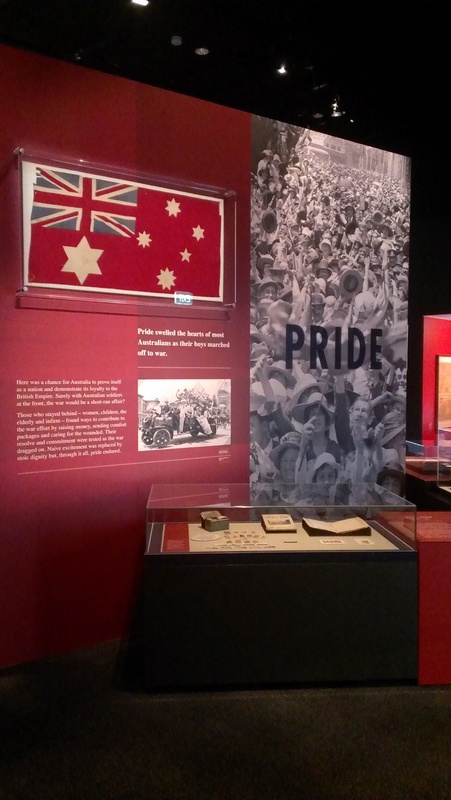 Another of Wendy Osmond’s key contributions was to make the Pride module the central piece to the exhibition – without pride – either in Australia or as members of the British Empire, the nation never would have gone to war. In a way the war fed off pride. Over the next few days I’ll post some photos of the individual modules and add a little commentary to what you may see if you have a chance to get to Canberra and actually see the show.